Hello my lovelies! 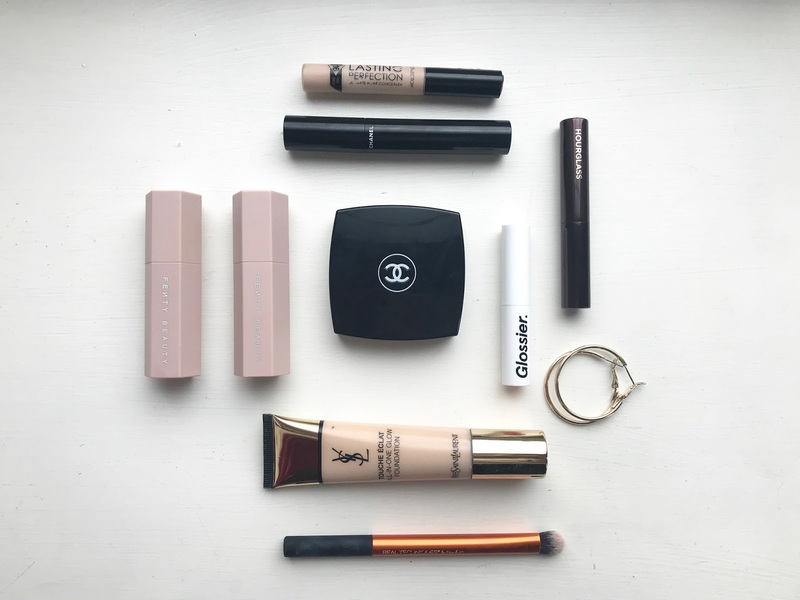 My husband and I just got back from a really relaxing family weekend getaway to the Scottish Borders, and today I'm going to be sharing the sort of capsule makeup collection that I took with me, alongside some new things I picked up at the Harvey Nichols in Edinburgh (aka, my happy place). I'll be giving a bit of a first-impressions review on some items from Fenty Beauty as well! I bought this to use as a subtle contour under the cheekbones and on the eyes and so far, I am freaking loving it. I shouldn't be surprised, given how much I love the Fenty Match Stix already (read my review here). This blends out so super easily with fingers and totally avoids the dreading 'brown line" that makes me hate most contouring products. It's contouring for those who hate contouring, but love cheekbones. I bought this hoping it wouldn't be too shimmery on the cheekbones and that it would give a pretty, sun-kissed glow. To my disappointment it does look to glittery on the cheekbones for my taste--but never fear! Because it looks FLIPPIN' AWESOME on the eyelids. The glitter particles are more finely-milled than those in the Glossier Lidstars and it just gives this gorgeous glow that's totally wearable on an everyday basis. 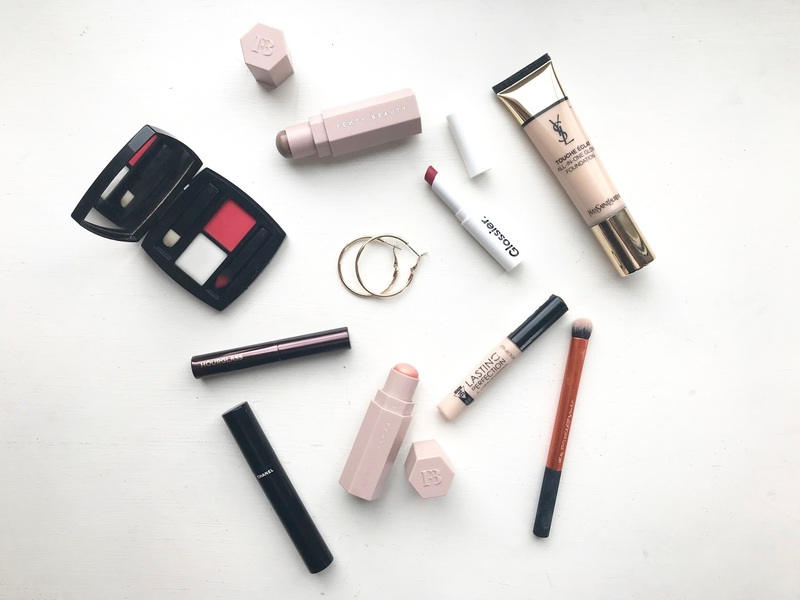 I've already reviewed the Chanel Lip Powder Duo here if you fancy a more in-depth review (hint: I love it), but I realised I've never talked too much about the Glossier lipsticks on the ol' blog. I love the colours and Crush is no exception--but they really cling to my dry patches and seem to last ok through eating, but really lift off when I drink water (which I'm trying to constantly chug lately). Y'all know I love this. Detailed review here. This little drugstore gem even covers my birthmark. Total winner, especially when paired with this Real Techniques brush. So I'm afraid I'm gonna have to jump on the bandwagon with this one and agree with other bloggers: it knocks Glossier Boy Brow out of the water. The two-sided applicator lets you have way more control and lets you achieve an even bushier effect than I ever could have dreamed of. Plus, there are way more colour options and Warm Blonde suits me perfectly, creating a more natural colour match than the Glossier option. As for the Chanel Le Volume, I will be posting a more in-depth review later. As of right now, I love it--but it does take a bit of work to get that fluttery, volumised, lengthened look that I love. It's not a one-swipe wonder...but I think it might be knocking my Tom Ford mascara off its pedestal! These gold hoops came in a set with a matching pair of silver hoops and the whole thing cost less than £3. They are surprisingly sturdy and somehow don't irritate my sensitive ears. I love them for adding a little extra something to my usual jumper-legging-slippers outfit. Have you guys tried any of these? What are your thoughts?